Do you find yourself dreaming of escaping to somewhere warm and sunny during the cold and grey festive season? Or maybe you are spending those days picturing yourself on a beautiful sandy beach, listening to the waves lapping on the shore in front of you? If this describes you then why not send out our A Warm Christmas ecards to your business customers and contacts? Showing that you don’t need snow to know it is Christmas and taking on a whole new approach to a White Christmas we really like this simple yet elegant design. 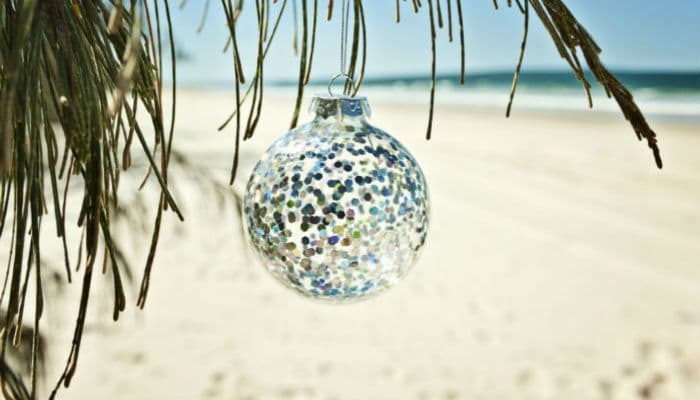 Featuring golden beaches and crystal blue waters in the background and one simple sparkling and glamorous bauble in the foreground, this is one of our electronic Christmas cards for business that truly captures the spirit of a holiday but presents it to during the festive period. As well as bringing a touch of beauty with the design of the animated e Christmas cards for business; we also allow you the opportunity to transform it into something that is unique to you, with customisable text and even the ability to place your own logo amongst the text you have written easily identifying your corporate brand. With our warm Christmas e cards you can bring a slice of sunshine to your festive season!